MUNICH — Next Wednesday (Oct. 16) new portraits go on display in Bavarian State Opera’s lobby. Twenty-one new portraits. Astrid Varnay, Dietrich Fischer-Dieskau, Kurt Moll, Brigitte Fassbaender, Lucia Popp, Edita Gruberová, René Kollo, Hildegard Behrens and Waltraud Meier are among the worthy singing subjects, company troopers all. But theatergoers expecting traditional oils on canvas in pretty frames may be in for a shock. The new dauerhaft pieces embrace painting, drawing, tapestry, photography, hot wax, and at least one video requiring its own flat-panel display, to be hung in a hall that once serenely separated our electronic world from the madness on stage. To create space in the company’s 114-year-old portrait collection, fifteen tired canvasses recently disappeared into das Lager des Theatermuseums, a.k.a. deep storage, leaving bare walls. Safe, at least for now, are well-varnished depictions of such epoch-defining Munich musicians as Heinrich Vogl and Therese Thoma, Wagner’s first Loge (1869) and first Sieglinde (1870). But 21 new faces? The growth spurt — involving the same number of visual artists and two years’ gestation — is intended to correct a lull. Apparently only conductor Wolfgang Sawallisch and impresario Peter Jonas have been added to the collection since the 1960s. And it serves another purpose. 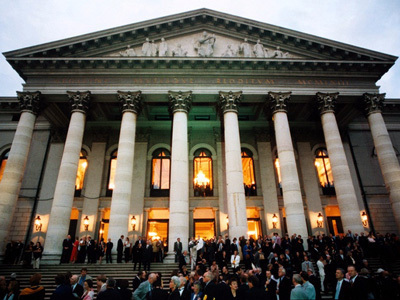 Fifty years have passed since Bavarian State Opera resumed operations at Munich’s National Theater, on Nov. 21, 1963, long after the house was cratered by Allied bombs. Rebuilding cost: 60 million Deutschmarks, or thereabouts. Friends of the company (Freunde des Nationaltheaters München e.V.) wanted to seize the occasion to acknowledge the work of singers in each subsequent decade. The result is portrait commissions that are a little front-loaded. Hermann Prey, for instance, who sang leading roles starting in the 1960s, is honored alongside salad-green contributors such as Klaus Florian Vogt, who began in the 2000s and may or may not prove to be a singer of lasting artistry. At any rate, the collection is made current, and presumably hipper, by this large initiative. Other subjects of the commissions include Munich favorites Margaret Price, Júlia Várady, Wolfgang Brendel and the still-active, though wobbly, Peter Seiffert. An odd choice is Fritz Wunderlich, the honey-toned Mozart tenor who died young. He went through the company’s apprentice program before the house reopened, but then bolted for a career contract in rival Vienna. Today’s singers in the lineup, besides Vogt, are Anja Harteros, Diana Damrau, Jonas Kaufmann, Christian Gerhaher and Wolfgang Koch. Administrative enthusiasm and the sheer scale of the effort have led to at least one creaky assignment, its outcome already made public, that for Damrau. The soprano gets photography-based treatment that manages to degrade and marginalize her without giving the viewer a sense of who she is. With luck, this will be the qualitative exception. Bronze busts of the company’s music directors, meanwhile, comprise another facet of the theater’s art. At present this series is complete through Zubin Mehta, who left in 2006. As it happens, a new Generalmusikdirektor, Kirill Petrenko, took over last month on a five-year contract, and so the just-departed Kent Nagano will likely soon be commemorated in three-dimensional metal. Print and online material related to the company’s 2013–14 season, not incidentally, showcases black-and-white photographs of the bombed-out house as well as 1963 crowds after the reopening. Soberly its slogan taps Nietzsche: Wie man wird, was man ist. How One Becomes What One Is — a smooth segue to a bleaker side of the retrospective. Official research has at last begun into correspondence between the Nazi Party and two former Bavarian State Opera GMDs, Richard Strauss (tenure 1894–1896) and Clemens Krauss (1937–1944). Petrenko, looking forward, gives his first concert next month, a freebie with Nina Stemme, Kaufmann, and the virtuosic Bavarian State Orchestra. A few days later, on the anniversary itself, he leads a new staging of Die Frau ohne Schatten, the opera that reopened the National Theater under GMD Joseph Keilberth one day before Kennedy was shot. Some of Petrenko’s initial work will be streamed at www.staatsoper.de/tv: Die Frau ohne Schatten (directed by Krzysztof Warlikowski) on Dec. 1; La clemenza di Tito (Jan Bosse) on Feb. 15, 2014; and Die Soldaten (Andreas Kriegenburg) on May 31. Here’s hoping the new portraits, in the aggregate, adequately reflect the virtues of this remarkable institution! This entry was posted on Sunday, October 13th, 2013 at 10:56 am	and is filed under Munich Times. You can follow any responses to this entry through the RSS 2.0 feed. Both comments and pings are currently closed.